Look, if there is one simple chart which sums up everything that is wrong with current thinking at the International Monetary Fund, then it is this one. Basically, I spent much of the day yesterday scratching my head, trying to work out how the hell the IMF could be forecasting Spanish GDP growth of 1.7% in 2012, of 1.9% in both 2013 and 2014 and 1.8% in 2015. And now it has dawned on me how and why they can. 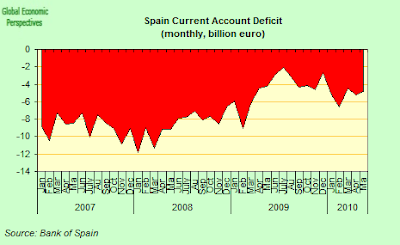 Quite simply they are forecasting current account deficits for Spain of 5.3% of GDP in 2010, 5.1% in 2011, 5.0% in 2012, 5.0 in 2013, 5.0% in 2014%, and 5.0% again in 2015. In other words, the assumption is that nothing fundamental is going to change in the post 2008 world, when compared with the years that preceded it. And this is clear when you come to look at the whole structure of current account balances revealed in the chart above, which are based on the IMF forcasts through 2015 as set out in the April 2010 World Economic Outlook. It is a case of plus Ã§a change. And all this becomes even clearer when we see that it isn’t only Spain where the current account deficits are going to persist, since they are also expected to continue in the US, and the UK. The structural surplus countries China, Japan and Germany – will also continue on their path, as if nothing important had happened. Which means the global imbalances will remain just the way they were, untouched and unmolested by the crisis – OK, some of Spain’s most severe “excesses” will be gone, since the deficit will fall from 10% to “only” 5% – and I can’t help asking myself, wasn’t that how we got here in the first place? The thing about these CA deficit assumptions is that they effectively make the argument a circular one. You don’t start with the real growth potential of the Spanish economy (that was what had me scratching my head yesterday about the degree to which the export sector could rise to meet the challenge). Now I realise I was wasting my time. 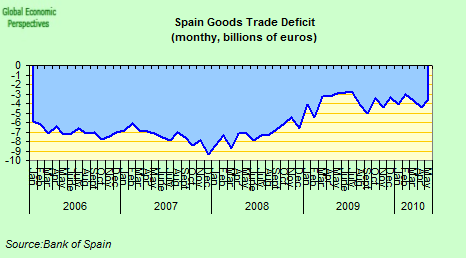 The export sector isn’t going to have to grow, since Spain is going to continue to run a trade deficit, out into the future and as far as the eye can see, it seems. 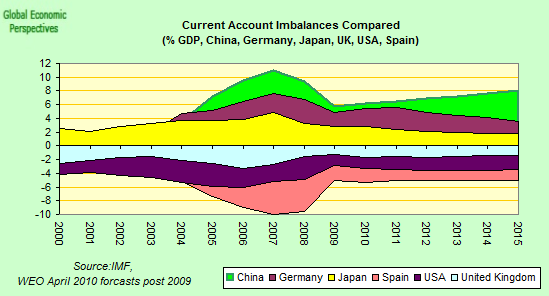 But the interesting question to ask is what exactly the current account deficit is going to be for. I mean, who exactly is going to be doing the borrowing that it will be funding? 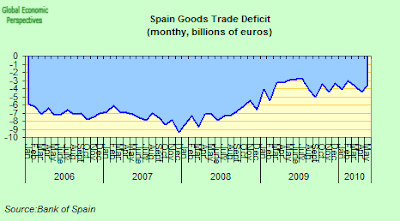 What has happened in Spain has been the result of what some have termed a “causal reversal”, since in the current case it is the capital inflows (borrowing, made possible by structural surpluses elsewhere in the Euro Area which lead to comparatively cheap interest rates) which produce the current account deficits, rather than the the normal balance of payments problem where growing deficits lead to the need to borrow. And it isn’t hard to see evidence for this kind causal reversal in the Spanish case. Under normal circumstances when a growing current account deficit produces the need for external borrowing, the exchange rate tends to fall, and the interest rate charged rises. In causally reversed situations, the currency tends to rise, and the central bank holds rates down to try and discourage the arrival of evn more liquidity. In Spain, there is no exchange rate to fall, and interest rates are set elsewhere – over at the ECB, and in the Euro Area interbank market – but still the funds arrived (via the interbank market) to meet the mortgage needs of a Spanish citizenry who were rather light on savings. Spain is, in fact, relatively insulated from current account pressures on both the above fronts, or at least it was. Then, of course, what was called the “European Sovereign Debt” crisis set in, and the interbank market seized up (effectively closing its doors to Spanish banks) while spreads on government bonds started to rise. In the Spanish case the term “Sovereign Debt” crisis is a complete misnomer, since as many commentators tirelessly point out, Spanish sovereign debt (at this point) is comparatively low by European standards, and what Spain is suffering from is a “Private Sector Indebtedness” crisis. Which is what makes the assumption of ongoing current account deficits look rather odd, because it leads me to ask: who exactly is going to be doing the borrowing that will produce the current account deficit, the private or the public sector? If it is to be the latter – and I can’t avoid the conclusion that it is going to have to be – then it suggests to me that the IMF are already assuming that Spain’s fiscal deficit is going to be above the 3% level for considerably longer than up to 2013. Let’s have a look and see. 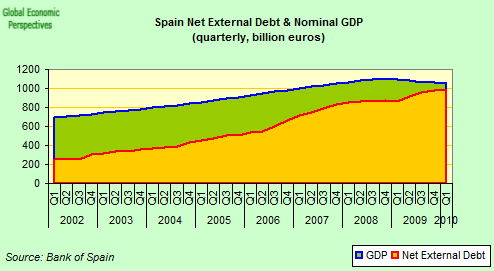 Spain has accumulated a very high level of net external debt. It currently hovers somewhere around 90% of GDP (see chart below), and continues to rise (naturally, that current account deficit), even as GDP hardly moves. Private debt (both corporate and household) is large, and shows no signs of reducing significantly. Corporate debt currently stands at around 125% of GDP, and while it is down slightly (2.1% in June) on an annual basis, it has remained pretty stable during 2009 and 2010. With Spanish company indebtedness well over the European average, and the economy at best lithargic, their accumulating more debt at this point seems very unlikely. Household debt stands at around 85% of GDP, and while it has been more or less stationary since mid 2008, even this has started to rise again even if ever so slightly (it was up an annual 1% in June). 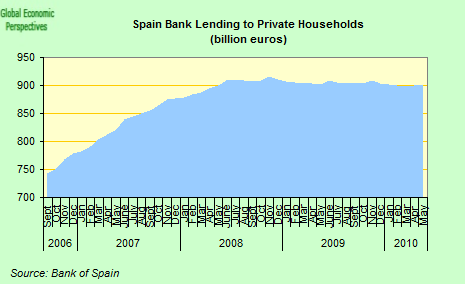 Some see this as a sign that credit is moving again, and thus a positive feature, but if Spain got into the mess it is in becuase its households became overindebted, accumulating yet more debt seems an unlikely solution. 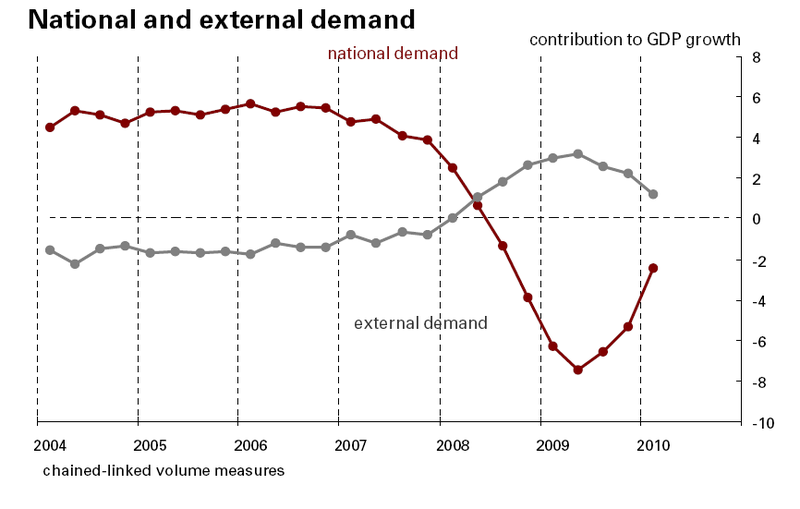 As I explained in this post, the slight GDP growth which was obtained in the first quarter of 2010 was primarily as a result of improved internal demand, and the net trade impact was negative (see chart below). And this is hardly surprising given that the trade deficit has deteriorated. And it would not be surprising to see the same pattern (of slight growth, largely supported by internal demand) being repeated in the second quarter, given that the trade deficit seems to have deteriorated further. And of course, the improvement in the current account position that was so evident in the middle of 2009 has now come to an end – but then the IMF seem (at this point at least) to be more or less resigned to this situation (although I can’t for the life of me understand why they are). Basically, the only serious reading which can be given to the IMF current account deficit forecast is that someone – the ECB or that new European Financial Stability Facility which conveniently came into official existence on Friday – will be intervening in the markets to provide the liquidity to make it possible to fund the deficits, although again, and for the life of me, I can’t understand why they should want to do so. And as I suggest above the only sense I can make out of those 5% annual current account deficits is that the government will be doing the borrowing to make them possible (via larger fiscal deficits than are currently formally anticipated) since I can’t realistically see the private sector being willing and able to assume the debt that will be required – and especially if they start to raise interest rates at the ECB. Really I am not sure what is going on here, since I’m sure I can’t be the only person around who is capable of making these (fairly reasonable) deductions. So if it is the investing community you want to convince, rather than the general public with nice headlines, something a bit more rigorous is really required. But then, at the end of the day, the forecasting process probably got itself stuck, between the need to show reasonable growth rates, and avoid consumer price index readings that smell of deflation – so they end up projecting inflation of a little over 1% a year between 2011 and 2015 – and of course, if you do that, there is no way you are going to get a goods trade or current account surplus, since the misalingment in Spanish prices is just to great. So here we are. My feeling is that all this will only go on for as long as it does, and one of these days the Spanish government, the IMF and the EU Commission will find themselves trapped between an angry group of those so-called “bond vigilantes”, and an even angrier group of Spanish voters, who will be demanding “Hungarian style” just why so many years of crisis and austerity have only served to get them even deeper into debt. At that point I don’t think I especially want to hang around to see what gets to happen next. Of course, another way to get demand side growth is to get job creation, but this is a chicken and egg argument, since you are not going to get job creation without an increase in final demand to encourage employers to take on the extra labour (with or without the tepid labour market reform which will only influence flows and not stocks). This is the error that many micro-economists who only focus on supply side issues fall into – they forget the key role played by aggregate demand. 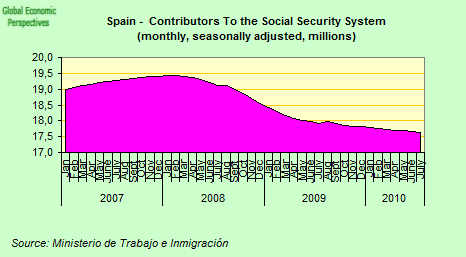 The latest news on this front is that affiliates to the social security system continue to fall (on a seasonally adjusted basis), and hit 17.6 million in July – down by just under 10% from the 19.4 million peak in January 2008. Evidently, failure to reverse this trend has implications for the social security system as well as for growth, which brings us to another curious detail about the IMF forecast, they make no projections for employment or unemployment post 2011, which makes you wonder where exactly the growth forecasts come from, since if you don’t assume job creation, and I think they are right not so to do, then the relatively strong GDP growth projections stand out even more strongly. Incidentally, if you are still confused by the arguments about the balance sheet impacts of debt, please look through the comments thread where I have attempted further clarification. Have you considered the current account evolutions between regions within the same country? As the German surplus declines (most likely partly due to stagnating imports from the southern EU – something which hints at the direction the GDP of Spain may actually go ) , there goes one source of current deficit funding (whether through government backed enterprise or the ESFS ) . I don’t think France or Germany will be in any hurry to expand their debt portfolios to the south outside of the ESFS either, whatever their current account status. That effectively leaves China as the main surplus redistributor, and we fall into the very difficult economic territory of global trade and politics, foreign exchange rates etc. to attempt to guess exactly how the flow of surplus money will be reinvested. I don’t see any way that borrowing and spending in Spain can increase at five percent either, except through the government … and even then I don’t see to what constructive end except readjusting slightly who holds the increasing pile of Spanish debt ? Maybe some are looking to make the Chinese economy more structuraly reliant on certain EU countries too ? Who knows. Nice post. I dont understand why you think the current account deficits need to funded by government or private sector debt. Maybe I am misinterpreting something here. The way I see it is demand needs to be funded with new debt first and then the deficits can occur. The new deficits dont need to be funded by surplusses being recycled because the new debts are just inflation. What I mean is new debt that enters the system through interbank lending is the result of new money being printed by ECB then it is channeled into the system through interbank lending. 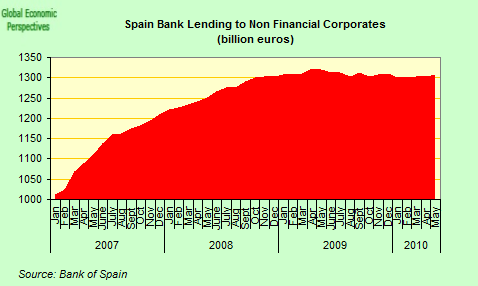 Also the more indebted the spanish governmnet gets the more collateral the banking system has(gov bonds) in which to borrow new created funds from the CB. Hello Danny, and thanks for your comments. Well look, this is a very complex issue, but the simple point is to do with the rules of book-keeping. An entry on one side of the national accounts has to be balanced by an entry on the other. There are two ways to meet a shortfall on the current account. Normally, within the Eurogroup the shortfalls are not met from reserves (which in a case like Spain would of course soon run out, this is the normal dial on the wall that starts to signal red when you get in the danger zone and start to have a “balance of payments” crisis. This dial has been dismantled and removed under the Eurosystem which is why there is no early warning system which tells us when countries start to get into trouble, and it is also why we are having the current (post hoc) debate about a team of Brussels economists to supervise economies and warn them when they might get into difficulty. So we are replacing an automatic pilot with a human manual one. So the accounts are squared by borrowing, but the issue is, you need someone to borrow. In any economy there are only a limited number of agents – households, corporates and government – so it has to be one of these. 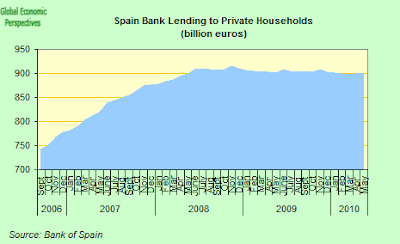 In the past it was Spain’s households and corporates who did the borrowing, but now their collective balance sheets are in a right mess, and until they have done substantial deleveraging they are not going to start becoming net borrowers again in any meaningful way, and particularly since the underlying asset against which most of the borrowing is secured (houses, warehouses and factories, land) continues to lose value on an ongoing basis. So the only party left who can borrow is government, but financial markets were even reluctant to continue lending to them until the ECB did a policy “U” turn on bond purchases in May, and the Commission set up the stability fund. This is why I speak of causal inversion here. Essentially on the private side, left to its own devices (ie without government stimulus) there is no “effective” demand, and domestic demand would be a negative for some years to come as population ageing takes hold (look at Italy) and economic agents deleverage. Obviously “demand” in the economic sense isn’t the same as someone simply wanting something (a new Porsche for instance, or Cesc Fabregas for FC Barcelona) it is wanting and being creditworthy enough to pay. So this is why the only party who can place additional leveraging on its balance sheet is the government, and this is possible, given the huge arsenal the ECB and the Commission are now mustering, the only thing that surprises me is why anyone over at the IMF would think this was a good idea, since it is simply subsidising in the short term what is unsustainable in the long term – Spain’s lack of competitiveness. This is just it, one thing all this quantitative easing isn’t doing is producing inflation. If we carry on like this, I don’t see why five years from now the whole Eurozone couldn’t become another Japan – with large government debt, a central bank filled to the brim with government bonds, ongoing massive liquidity provision, and no real inflation to speak of, all thanks to having own currency to print debt in, and a significant external trade surplus with the rest of the world. What this means is that we could convert the entire zone into another Italy, with a very productive (northern) area, and a periphery which looks more like the mezzogiorno. As one (Spanish) friend of mine cynically commented recently, one solution could be to pay half of Spain’s long term unemployed to simply go and lie on the beach, using liquidity generated from the ECB to pay them – in fact we already have the example of the regional unemployment subsidy (PER) in Andalusia which effectively pays people to stay at home for a significant part of the year (and only work during the olive season). This would allow the Germans the freedom to do what they like and do best – work away at it, exporting like mad – without the downside if having to worry about whether the Eurozone would fall apart or not. “Also the more indebted the spanish governmnet gets the more collateral the banking system has(gov bonds) in which to borrow new created funds from the CB”. Oh yes, this is the mechanism which enables the government to keep spending, and is why spreads don’t baloon. But we have already seen Spain’s bank dependence on the ECB get well beyond the average in June, just how far can this process continue, and the zone hold together? But even if it can go on indefinitely, there is a deeper and more important question. Is it desireable? Is this really in the long term interest of the Spanish people? Isn’t it really better to take some hard decisions now, and look forward to a brighter future. Of course, and this can produce very strong tensions between regions. Just look at Italy, and then in Spain, Catalunya more or less plays the same role Germany plays in the Eurozone. The thing is nation states have an (often resented) national treasury to do some redistribution, it still isn’t clear that the Euro Area will. Of course, someone could ask, is it not possible Edward to have a country of vigourous savers who run a CA deficit” – and I would answer, naturally it is, this is the Italian case. But be careful, Italian households are comparatively strong savers, and they run a small CA deficit, but unless the government run a deficit over the 3% EU limit the country has more or less zero trend growth. This is my point, to imagine Spain with GDP growth of over 1.5% (at this point) you have to imagine fiscal deficits of over 3%. In fact this issue is often portrayed as a debate between academic and “non academic” economists, whereas in reality both sides have their academic and non academic advocates – what it is really about is a debate between applied macro economists and micro economists. Time will tell us precisely who has got this one right. Let me clarify this statement. What I mean is that the increase in overall debt that enters the system is due to new money being printed. So therefore surplusses from other nations dont need to be recycled. I dont advocate this system at all as it is completely unsustainable but Im just trying to explain how it appears to operate. “There are two ways to meet a shortfall on the current account. The current account IMO in reality is automatically offset by a capital account surpluss.They dont have to be funded from reserves or borrowings. A current account deficit is just a net negative flow of money between two nations in conducting trade (from deficit nation point of view). When the booking is recorded all the money that left the country on net to acquire imports is automatically counted as a surplus on the capital account. So to sustain a current account deficit you can just print money and channel into the economy through interbank lending and foreigners continue to accumulate your currency. Also remember that ECB money printing is relatively limited to equity trade offs for under a year, which keeps a relatively tight reign on the money market. Its bond purchase program was accompanied by liquidity soaks. Maybe the EFSF will be issuing and circulating liquidity on longer bonds , but this is not quite the ECB, rather a combined sovereign issuance. Well, Edward, it is mainly a manifestation of the financial aspects of the crisis, and therefore you have to approach it from that point of view and not from another. For example, the financial system has to absorb its losses, and frankly unemployment has nothing to do with this. But chanelling money through governments – which has to be repaid off the back of private enterprise, wages etc. which therefore implies employment – means tomorrows workers will be paying the cost, or the financial system will be further into loss : the ECB does not buy sovereign debt in general ( normaly not even on the secondary market) , it only lends against it. 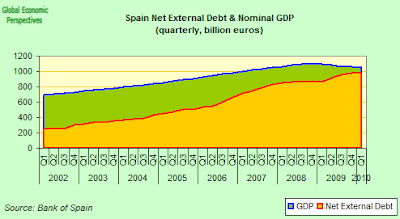 Spain may be paying near 5% – is there any government enterprise that makes that much, except by borrowing of course ? Does it help increase productivity in the long run or make it more dificult due to the need for higher taxes. Does it shape the economy to free market competivity and success or is it a form of state capitalism ? Each to their opinion. Danny – u seem to be contradicting yourself. that IS borrowing. just because its printed at the ECB, it isnt free money. Its LENT to, in your example, Spanish banks. So in this instance its private as opposed to public borrowing. Also, to be clear, having a capital account surplus does not solve any problem. Its merely an offsetting bookkeeping entry. In pure cashflow terms, if there is a current account deficit then there is external borrowing (ignoring EH’s reserve rundown alternative or some kind of international transfer gift aid!). Fantastic 1st chart. Great analysis too. If you take the analogy of Spain being to the EU what Andalucia is to Spain then you clearly see that the EU will need to effect a policy direct transfers to Spain to stabilize it. I.e. provide free money to Spain, not more debt. This is what Spain has done with Andalucia for decades. My question is if the Germans will tolerate a direct transfer policy similar to the Andalucian one. If not, and this is a political issue, then Spain should engineer its exit from the Euro immediately. This is the only other alternative to pay your debts (debts in pesetas will be less onerous) and provide a boost to growth (via more competitive exports). Anyway, I think there is a better approach to the so called sovereignt debt crisis. 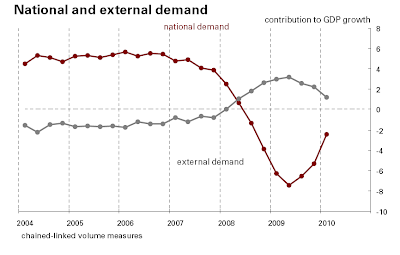 4Âº Greece repayment only if they achieve certain growth level in the future. Of course, in the third point I mean bailout to the affected banks.